“Shadow’s Over Innocence” is a short story set about a dozen years before The Emperor’s Edge. In it, Lindsay Buroker takes a closer look at the mysterious and deadly assassin Sicarius, who plays a central role in the ongoing series, also named The Emperor’s Edge. As the tale begins, Sicarius has just completed a successful assassination for his liege lord. Upon his arrival at the palace, he interacts with Emperor Raumesys Savarsin, Commander of the Armies Hollowcrest, and five-year-old Prince Sespian; something that allows this silent assassin to divulge parts of his murky past, explore who he might truly be, and internally express his true feelings about those he serves – years before his chronicled exploits. As a less-than-enamored reader of The Emperor’s Edge (The book was far too “campy” for me. ), I choose not to continue along with the series, but this short story was one I felt compelled to give a try for one simple reason: Sicarius! While Amaranthe Lokdon was definitely the protagonist of the series, this near silent, mysterious killer was, by far, my favorite character. Yeah, I know, I tend to say that assassins are a bit overused in fantasy, and I still stand by that opinion, but Buroker’s take on this standard character was very compelling. This was mainly due to how Sicarius was portrayed: saying very little, blending in with the crowd, keeping to himself, not trusting people, and being skilled at numerous tasks. Traits which allowed this royal assassin to do his job with high efficiency and little fuss in The Emperor’s Edge. A standard Sicarius mission going something like this. “Sicarius, go kill Joe Blow.” Sicarius disappears. Sicarius reappears some time later and says “Mission completed.” End of story. No endless planning. No annoying brooding. No monologue-ing. Nope, just a skilled assassin doing his job. 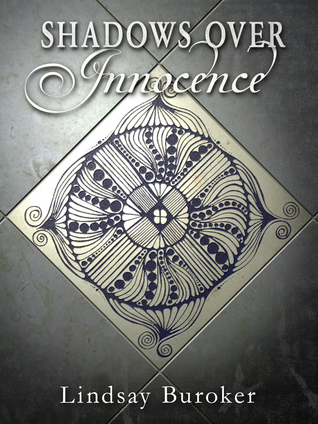 And in “Shadows over Innocence,” I was finally allowed a glimpse behind the stoic façade at how and why Sicarius acted as he did as well as what he truly felt. Now, if this story is one you’d like to try, please realize it might be more entertaining if you have read book one of the series and are already familiar with the characters highlighted here, but if you decide to start with “Shadows,” never fear, because it is an entertaining adventure tale in its own right, filled with wonderful interactions between Sicarius and the other main characters as well as having a rousing assassination tale of its very own. Purchase this story at Amazon. This entry was posted in 4 Stars, Assassin, Fantasy, Low, Self-Published, Short Stories and tagged best indie fantasy, best indie fantasy series, best self published fantasys eries, Lindsey Buroker, self-published fantasy, Shadows of Innocence, The Emperor's Edge, The Emperor's Edge short stories. Bookmark the permalink.